Director Ridley Scott’s Prometheus, a prequel to his 1979 science-fiction movie Alien, left viewers with more questions than satisfaction when it was in theaters, but the Blu-ray is supposed to provide answers. Prometheus stars Noomi Rapace (The Girl With the Dragon Tattoo) and Logan Marshall-Green (Devil) as archeologists who discover what they believe is a clue to the creators of mankind. Thanks to funds from wealthy CEO Peter Weyland (Guy Pearce, Lockout), the scientists join others on a mission to space led by Meredith Vickers (Charlize Theron, Snow White and the Huntsman). But when they get to their destination, instead of finding out where humans came from, they end up fighting for the human race. Also starring Michael Fassbender (Shame), Idris Elba (Ghost Rider: Spirit of Vengeance) and Rafe Spall (Anonymous), the R-rated film grossed a tidy $126.5 million in theaters, but left many viewers unsatisfied. Critics and moviegoers alike did praise the movie for its gorgeous look and stunning visual effects, though. As The New Yorker critic David Denby put it: “The movie may be a scare show that leaves many questions unanswered, but Scott’s craft earns an exhausted kind of respect.” We agree. Fox is trying to clear up some of the mystery with seven hours of special features on the two-disc Blu-ray/DVD Combo Pack and four-disc Blu-ray 3D/Blu-ray/DVD Collector’s Edition. 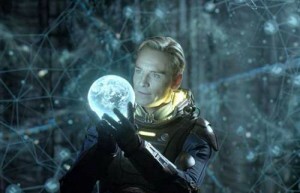 Both Blu-ray versions also include a downloadable digital copy of the movie, but Prometheus was made available on video-on-demand and download before disc, so some fans might already have it. Brilliant film! Gotta love a movie that provokes great conversations. Yeah, that’s kind of what I thought of it when I saw it in theaters: Annoying storywise, but gorgeous to view. On the story, I think it’s great to provoke conversations in film, but this one felt to me like it was trying too hard to be artsy and commercial at the same time. Just wasn’t entertaining for me. But like I said, the visual are great. I’ve always been a Ridley Scott fan, and I still am after this film.